Normally, the group is given a topic for discussion. The interviewers will monitor each student, noting their contributions. Sometimes there is no specific topic so the group will have to choose one. Even in this case the interviewers will observe exactly how the individual students reach agreement. Sometimes you will be given a debating position in advance. This might be different to your personal opinion. In this situation you must show that you can structure and conduct your argument logically, regardless of the opinion. Additionally, you must show that you can establish yourself in the group and demonstrate leadership. The focus is on your social skills. In a team you usually act differently or present yourself in a different way than you would in a individual presentation. In a group discussion, students can take different roles. These are not usually specified by the interviewers. Even before starting the actual discussion, the group should define a time keeper to ensure time limits are adhered to. If you accept this role it is a good idea to put a large clock on the table, and to regularly signal the time that is left. Each group also needs a host. The host should link individual contributions together and draw conclusions from the content. The host should also ensure that everyone is involved in the discussion. If a student is given in advance a specific line of argument but is too shy to say anything, the host should do their best to integrate that student into the discussion. It is also necessary to have participants who can lead the discussion. 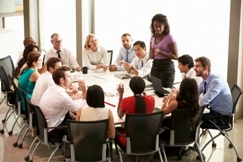 The roles in a group discussion, however, are usually not clearly separated. If someone else has already taken the role of host you can still take a leadership role by asking others for their opinion. Some group discussions are tense so you might find that some participants act aggressively, while others shy away from defending their arguments. Neither leaves a good impression. If other candidates attack or provoke you personally you should remain confident. You will leave a good impression if you keep your composure and stay calm and objective. This can also calm down the discussion generally and steer it in a productive direction. Also avoid dominating the group too much as it's not about you. The objective is delivering a group result and testing your teamwork skills. State your arguments clearly, calmly and confidently, but let others get involved and integrate shy candidates into the conversation.